Free Shipping Included! 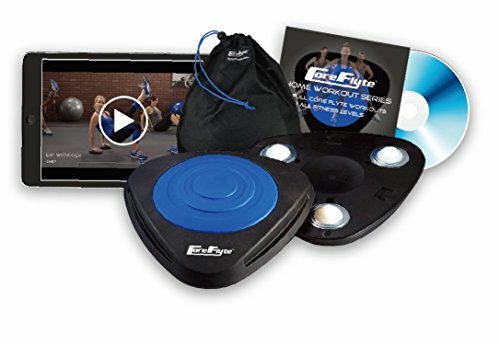 Core Flyte Pro V3 - Increase Athletic Performance, Build a Rock-Solid Core & Activate More Muscle (Pair, Online Workout Videos, Carrying Case + Guide) by Flyte Fitness at Strongman Pictures. MPN: B00K6MKM00. Hurry! Limited time offer. Offer valid only while supplies last. Core Flytes are Stability Trainers that Roll With You. Core Flytes incorporate a stability component into both stationary and moving floor exercises. Core Flytes are Stability Trainers that Roll With You. Core Flytes incorporate a stability component into both stationary and moving floor exercises. Core Flytes enable movement on all types of gym floors and most surfaces around the home (including non-slip rubber floors). When combined with any exercise, the Core Flytes activate core and abdominal muscles, plus more secondary and supporting muscles around the joints, to improve athletic performance and prevent injuries. Core Flytes use innovative and patented technology, with ball transfer units (BTUs) used in the aeronautics industry, to take any functional training workout to the next level. Core Flytes are for active, fitness enthusiasts who want to add a new dimension to their training programs. The level of difficulty can be adjusted simply by using the Core Flytes on different types of floors. Core Flytes are designed to move more freely over harder surfaces, yet be more controllable on softer floors. This allows you to increase or decrease the amount of effort required to stabilize the Core Flytes during exercises. Beginners can exercise with the Core Flytes on tight loop carpet, or a cushioned gym floor, to have better control. While experienced gym-goers can use their Core Flytes on concrete or hardwood floors for the extra degree of difficulty. Package contains 2 Core Flytes, carrying bag, home workout DVD plus an 8-week workout chart suitable for all fitness levels, full of challenging new exercises. Benefits: Strengthens and improves stability of core and abdominal muscles, Strengthens secondary and supporting muscles to prevent injuries during training and competition, Improves coordination and reflexes for better athletic performance, Ideal for strength, cardiovascular training, Yoga, Pilates, flexibility, and physical therapy exercises, Perfect for total body workouts, circuit training, and group fitness. Very portable: Lightweight, durable and easy to store. For all fitness levels: Adjust the difficulty by using on surfaces with more or less friction or changing the range of motion. Used by elite athletes, including NFL players, to improve performance, as well as older adults to rehab injuries -- and everyone in between. Truly multi-surface: Moves well on any flat surface, including non-slip rubber gym floors, carpet and hardwood. Inspires creative workouts: Introduces a completely new type of mechanics to popular exercises, and provides a platform for the innovation of new exercises. Innovative technology: Uses patented ball transfer technology inspired by the aeronautics industry to facilitate omni-directional movement. If you have any questions about this product by Flyte Fitness, contact us by completing and submitting the form below. If you are looking for a specif part number, please include it with your message. Brazilian Belle - Best Weight Loss Waist Trimmer Corset Ab Belt for Women - Neoprene Trainer, Cincher, Stomach Body Shaper - Perfect for Gym, Yoga & Cardio - HIGHLY DURABLE!